This young man is both persistent and resilient. 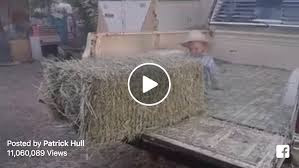 He is persistent in that he does not give up on moving a hay bale several times his size just because it doesn’t fly off the truck on the first push. He is resilient because he tries several different ways to tackle the problem, always noting his progress along the way. We can sense his satisfaction by the end of the clip. It is easy to recognize that this is what we want for children. This young man will most likely grow up to be a happy, healthy, problem solver. This is why your teacher does not want you to prevent your child from experiencing any kind of struggle while learning. Struggle teaches lessons that last a life time – especially when children know they are loved and cared for. We also want our children to have a resilient faith. The world in which they live is hard, selfish, and dangerous. We cannot include faith as a small part of our life and then hope for the best. Faith needs to BE your child’s life. When children are baptized they are brought into the family of God. The more time they spend with that family, in God’s word, the more their faith grows. The habits of praying before each meal, daily devotions, attending church activities, and actions of service toward others flow from a resilient faith. A resilient faith is one that persists in the face of trouble and temptation. A resilient faith learns from struggle. A resilient faith rests easy in the love and care of God. God provides us with so many ways to nurture the faith of our children. Get started moving that hay bale. God is on your side.